MultiAir's electrohydraulic command of intake valves increases fuel economy. BALOCCO, Italy -- Chrysler Group may incorporate Fiat's new MultiAir fuel-saving technology in some gasoline engines, Fiat sources say. 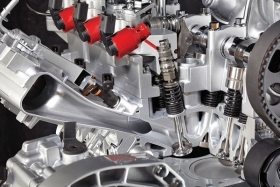 Fiat S.p.A. considers the variable valve timing system a breakthrough. The company says MultiAir improves power by about 10 percent and reduces fuel consumption 10 percent. The MultiAir system provides direct control of air and combustion in engines, cylinder by cylinder and stroke by stroke, without using the conventional throttle. That saves energy wasted in traditional systems. Fiat will offer its first MultiAir engine in Europe this month on the Alfa Romeo MiTo subcompact hatchback.  The 2.0- and 2.4-liter four-cylinder units produced for the Chrysler Sebring, Dodge Caliber and Avenger and Jeep Compass and Patriot. MultiAir units could arrive in late 2011.  The Pentastar V-6 engine family now under development. The 3.6-liter Pentastar family will replace seven Chrysler engines. The new V-6 will debut next spring on the 2011 Jeep Grand Cherokee. MultiAir could be added in the second half of 2012.